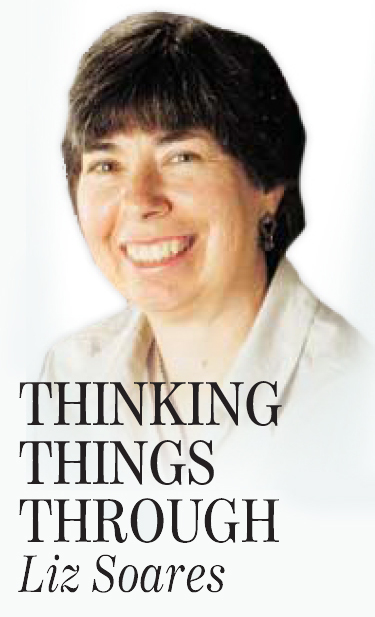 Some readers said a columnist was elitist to write about supermarket etiquette, but that has nothing to do with having valuable expectations and standards, Liz Soares writes. A column I recently wrote about what I perceived as rudeness in the supermarket prompted a number of disparaging reviews. I am glad the column interested people enough that they took the time to comment, but there was one description of me that I must take issue with. I am not an elitist. In fact, I laugh at the very idea. My grandparents immigrated from Brazil and the Portuguese Azores Islands. One set of great-grandparents came down from Quebec. They worked in cotton mills in southeastern Massachusetts and Rhode Island. According to an early 20th-century census report, no one in the house shared by my maternal great-grandparents, grandparents and their two children spoke English. My great-grandfather kept a cow in the backyard of his in-town neighborhood and sold the milk. My grandfather, once he bought a house a few blocks away, raised a pig every year, grew strawberries, made his own wine. That’s trendy nowadays, but believe me, in the 1930s, it was survival. When I was born, my father’s occupation was listed as “woodcutter” on my birth certificate. He was cutting trees with a family friend called Ti’ Mana’ (a Portuguese colloquialism for Uncle Manuel), to make room for house lots. Dad eventually bought an Arnold Bread franchise, and he and my mother also ran a successful day-old bread business. We were then able to travel to Florida every year — in our station wagon, with a cooler of sandwiches. We stayed in dubious motels in the South along the way. I was the first person in my immediate family to go to college. There is no silver spoon in this story. An elitist, I think, would live in Cape Elizabeth or Manchester, or a pricey Portland condo. I don’t. An elitist would drive a luxury car. My first car was a 1964 Ford Falcon. I have driven Toyotas since 1985, sometimes for more than a decade per car. Elitists like name brands. Question: Does L.L. Bean count? OK, I do have an Eileen Fisher jacket, but I bought it at Goodwill. Of course, conspicuous consumption is only elitist if you think your Manolo Blahniks make you a better person than someone who buys their shoes at Payless. Otherwise, it is just conspicuous consumption. I am snooty sometimes. I care about food. I try to eat organic, and avoid GMOs. Although I must have some good Maine fried seafood at least once each summer, I opt for healthier options the rest of the time. It’s not elitist to believe that what we wear sends a message about who we are. Pajama bottoms should not be worn in public. Please look at your backside in the mirror before venturing out in public in leggings. Dress up when you go to a funeral. It’s not elitist to believe that thinking is a good thing. Reading books is essential. So is being aware of current events. Ignorance is bad. Anti-intellectualism horrifies me. Anyone in any field of work can be intellectual. It’s not an either/or. It’s not elitist to believe that those who demean learning make it possible for our government to run amok. We didn’t think it was worthwhile to pay attention. We didn’t realize that history has so much to teach us. Um, that’s not the way it works. Curse words hold onto their power because we want them to. It will never be OK to use them in public. No, I’m not an elitist simply because I objected to a fellow shopper moving my groceries out of the way so he could assume my place in line. Nor am I an elitist because I think our president should be someone who reads books, who understands history and civics, who is polite and well-mannered, and who values science. You don’t have to belong to “a select group that is superior” to have expectations. Standards are a good thing, whether you’re high and mighty or the granddaughter of a guy who kept a pig in his yard.